A word of advice for anyone studying fashion: it can really take the joy out of it! I'm sure I'll feel more positive post dissertation but at current shopping/buying/browsing fashion is just not as fun. He's really captured the beauty of one of those 'isn't nature wonderful' sunsets. The colours are stunning. Shame about the price cough £175..ouch. 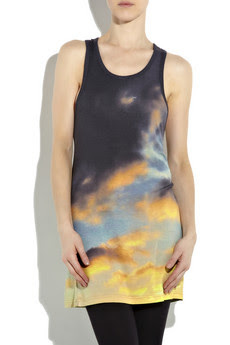 Also in the collection are tees and t-shirt dresses and a slouch biker jacket carrying similiar prints. Dreamy.